Have you set up a goal that you would like to easily reuse within the same project? 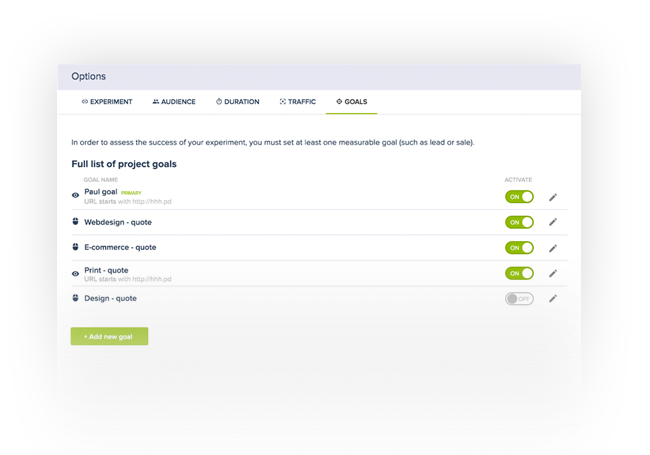 With the Library, you can simply reuse similar goals within the same project across different experiments. However, please note that if you create a new project, the same goals will not reappear and you will have to set up new ones. 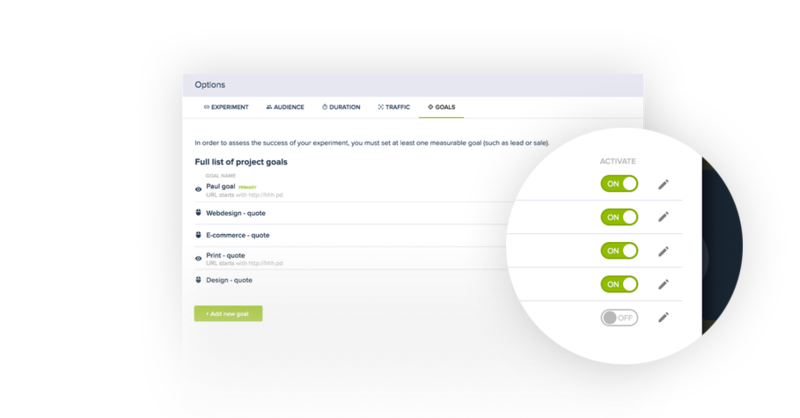 You can easily change which goals within a project you would like to track and which goals you would like to suspend using the sliders indicated on the image below. Clicking on the green button will turn it grey and disable the goal. 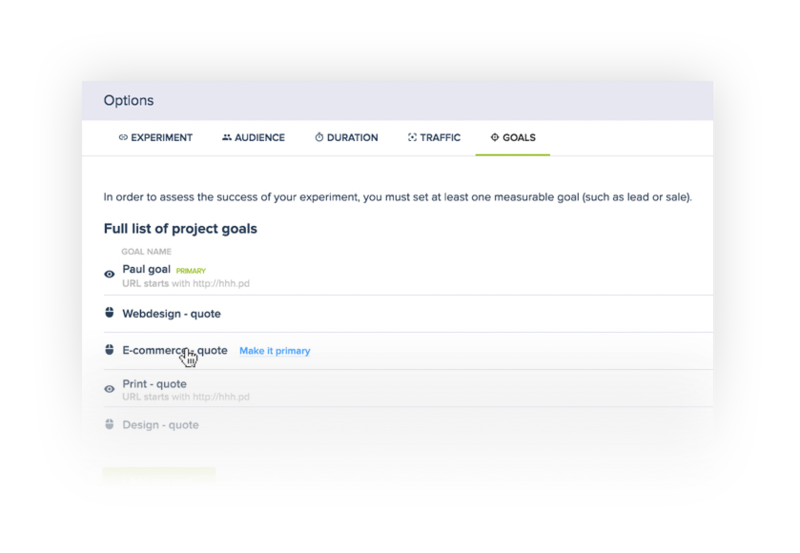 Please note: if you disable a page view goal that is not used by any other experiment within the project, it is permanently deleted. 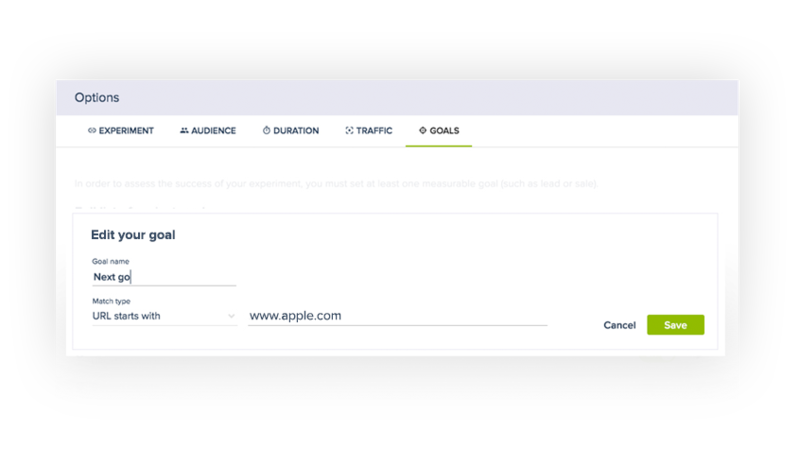 A primary goal is the main metric you are hoping to improve when creating an experiment. When an experiment is running, you will see the percentage ‘Uplift’ it is achieving in the results page. This uplift is a measure of the increase in conversions of a scenario in comparison to your Original scenario, for your primary goal. Therefore, select as your primary goal the conversion goal that is most important to your test. We understand that your priorities change over time, therefore we have made it extremely simple to alternate between your primary and secondary goals. You simply hover next to the titles of your goals to change their hierarchy. Do not worry. Changing the hierarchy merely changes which goal is shown first in the platform in the result page; it in no way affects data collection.